Synqit is a useful piece of software designed to help you import contacts and phone numbers from various sources into Skype. Using the app is a simple process since you just need to select the source containing the numbers after which the program will configure the synchronization job. Synqit can connect to just one source at a time, so if you need to sync multiple sources you will need to run it for each of them. If you add more contacts to one of the sources and you want to add them to Skype, you will need to repeat the sync job via Sync it. 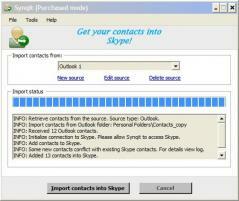 For now, the app allows you to import contacts into Skype from Gmail, Outlook, Yahoo or Plaxo.